Langston Faizon Santisima (born June 14, 1968), professionally known as Faizon Love, is an American actor and comedian. He is best known for roles in the film The Meteor Man, Don't Be a Menace to South Central While Drinking Your Juice in the Hood, Friday, B*A*P*S, Elf, The Replacements, Made, and Couples Retreat. Also, he is known for his role as Wendell Wilcox on The Parent 'Hood from 1995-1998 and Maurice Starr on BET's The New Edition Story. Santiago de Cuba, Cuba, U.S.
Love was born Langston Faizon Santisima in Santiago de Cuba and grew up as a "military brat"; he was raised in San Diego, California and Newark, New Jersey because of his father's career in the United States Navy. Love got his start as a stand-up comedian at age 15 and made his acting debut in an Off-Broadway at the age of 19. His motion-picture debut, Bebe's Kids, had him providing the voice of comedian Robin Harris, who died before production began on the film; Love offered a close vocal impression of Harris. He then had a role in The Meteor Man, starring Robert Townsend. Townsend then cast Love in a co-starring role on his sitcom The Parent 'Hood. Love co-starred in Couples Retreat (2009), a comedy film chronicling four couples who partake in therapy sessions at a tropical island resort. In 2011 Love starred in a theatrical production of Our Town by Thornton Wilder, alongside Washington Wizards teammates Gilbert Arenas and Etan Thomas. In 2012, he played the role of Stringer Bell in the satirical trailer for The Wire: The Musical. In June of that year, Love started to appear in a series of commercials for the pre-paid wireless provider Boost Mobile, promoting its new 4G phones. In 2014 Love made a series of controversial Twitter comments in the wake of the sexual assault allegations against Bill Cosby. Defending Cosby against the charges, Love used profanity and racial slurs against Cosby's accusers as well as comedian Hannibal Buress, who had alluded to the allegations in a stand-up routine. In 2015 Love once again took to Twitter to defend Cosby, dismissing those African Americans who believed the allegations as "spineless monkeys". On March 7, 2017, Love was arrested in Columbus, Ohio on a charge of misdemeanor assault. An altercation with a valet occurred at John Glenn Columbus International Airport, whereby video showed him grabbing the valet behind the neck in the baggage claim area and throwing him onto the ground and into a desk. Love filed a plea of not guilty. ^ a b Williams, Kam (October 7, 2009). "Interview: After Playing on the New York Giants for two years, Faizon Love". DallasBlack.com. Archived from the original on October 11, 2009. Retrieved October 9, 2009. ^ "The Cast". The Replacements. Warner Bros. 2000. Retrieved January 13, 2007. ^ "Just My Luck" (PDF). Regency Entertainment. 2006. Retrieved January 13, 2007. ^ "Family Tree". The Big House. ABC. April 2004. Archived from the original on March 18, 2004. Retrieved January 13, 2007. ^ Ryan, Tim (January 28, 2002). "Big screen wave riders". Honolulu Star-Bulletin. Retrieved January 13, 2007. ^ Trio of Ladies Going on Couples Retreat at TV Guide. October 15, 2008. Retrieved on October 15, 2008. ^ "Boost Mobile Ad Pimps WiMax 4G". CNET. Retrieved July 1, 2012. ^ Callahan, Yesha (November 24, 2014). "Faizon Love Had a Profanity Laced Twitter Meltdown as He Showed Support for Bill Cosby". The Root. Archived from the original on 2016-01-04. Retrieved 2016-01-15. ^ "Faizon Love supports Bill Cosby, calls Hannibal Buress a house N***a". The Grio. November 22, 2014. ^ Rogers, Jazmine Denise (July 7, 2015). "Faizon Love Slams Blacks Over Bill Cosby Outrage". Madame Noire. ^ Associated Press (March 8, 2017). 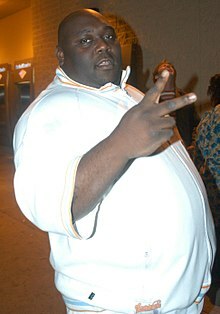 "Faizon Love arrested in Ohio after airport altercation". Fox News Entertainment.